You try your best to keep your home and family safe from harm. Having smoke detectors throughout the home is a great start to managing their safety. There are times when the smoke detector can be a challenging feature in your household, especially when it starts chirping intermittently. You may not know what to do when you first hear that sound, but don’t panic. There a few things you should know in order to alleviate the issue. If you’re wondering “How do smoke detectors work?” don’t worry we cover that too. 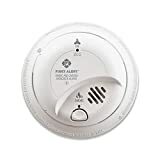 Because smoke and deadly gases spread quicker than a fire, it is imperative that a smoke detector, or smoke alarm, be placed on every floor of your house. The main reason to own and install a smoke detector is for security and safety. It can cost thousands of dollars to replace your valuables if your home burns to the ground because you didn’t have a smoke detector. Although you may lose lots of money, the lives of your family are priceless, so it’s better to have it in working order. An average of 2,000 deaths occurs every year, in the United States, as a result of home fires. 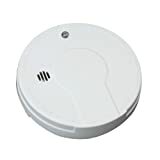 Ionization smoke alarms have an ionizing current that flows through 2 plates. When smoke enters the detector, it disrupts the current’s flow. This disruption causes the alarm to sound. Photoelectric smoke detectors harbor a beam of light in the alarm’s chamber. When smoke enters the area and crosses the beam, the light’s line is broken and triggers the alarm. Smoke detectors will chirp intermittently and constantly if it is not functioning properly. Usually, the sound will occur every 30 seconds. Don’t panic. It’s only chirping because there is a problem with the device, not because there is a fire. Change the battery. Traditionally, chirping means that your batteries are low. Always run a test to make sure the new batteries, as well as the device, is working properly. The test button, located on the front of the device, should beep when it is pressed. Replace the device. If you have changed the battery, but the chirping continues, then you’ll need to have the device replaced. Smoke detectors generally last about 10 years. Smoke detectors can be added to your home security package at any time. This is an extra measure to keep your loved ones out of harm’s way. Home invasions are not the only problem you can have in your home. An unsuspecting fire can be deadly. Without a monitoring company, you and your family won’t be fully protected. Monitoring is 24-hours a day. If you have a smoke detector in conjunction with a home automation and security system, your monitoring company would be able to detect if there is a fire that is spreading throughout your home. This is a good idea whether you are away or at home asleep. 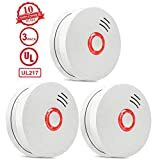 Protect America is a security and monitoring service company that has excellent packages for your home security needs, including smoke detectors with home automation capability. Discover for yourself how easy it is to install the security devices and have a monitoring company watch your back 24/7.